The office and store is located in the building immediately to the right when you enter the resort property. Please check in here when you arrive. Our store offers Ice, Beer and Ciders for sale. As well as a small amount of candy, pop, chips and other camping and personal items available. Quantity and selection will vary. All cabins and chalets are equipped with dishes, utensils, pots and pans. You will need to bring all bedding, food, beverages, personal and recreational items. All of the units are equipped with small bar electric bar fridges, and propane cooktop stoves. There are no ovens in any of the units. Spruce Wilderness Lodge offers two log chalets with showers, flush toilets, wood stoves for heat, propane stoves, propane fridges and a propane BBQ on the patio. Each chalet has a double size bed, two twin beds, and a double size hide-a-bed to ensure a comfortable sleep. The water to the chalets is pumped from a ground well. The water from the well is clean and clear and very good to drink. Please conserve water when you can. Due to our off grid set up when the power is off the water supply is not at full pressure. We have a reserve pressure tank but encourage your high water usage to be done while the power is on (ie. showers, dishes). Click here to see pictures and details of the chalets. Check in is at 3pm and Check out is at 11am. Please visit the Office upon arrival to check in. Pre-reservation amount is due before arrival. First come first serve drive-in payment is due before unloading. Our six cabins feature wood stoves for heat, cold running water, propane stoves, electric bar fridges and a propane BBQ. 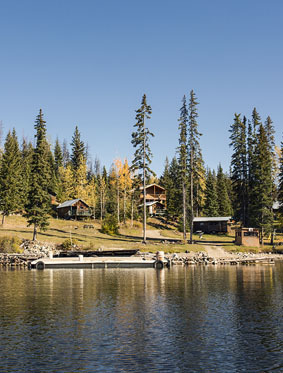 These cabins can accommodate varying numbers of guests. Bathing facilities for the cabins are available in the central washhouse which is equipped with hot showers and flush toilets. The water to the cabins and wash house is pumped from the lake and treated. Due to the lake water system the Interior Health Authority recommends that you boil the water for 1 minute before drinking or using for cooking. Click here to see pictures and details of the cabins. All vehicles (cars, trucks, utility trailers, ATV's, dirt-bikes) must be parked in our parking lot. Once you check in at the office you can drive to your accommodation to unload. Once you are finished please move your vehicle to the designated parking lot. For safety and insurance purposes we do not allow off road vehicles to be ridden within the cabin/camping area. You are welcome to bring any off road vehicles as we have extensive decommissioned logging roads and trails near the resort. However they must remain in the parking lot when parked/stored. There are 4 campsites, all with lake views. Each campsite has a picnic table and small fire pit for cooking. The washhouse is available to you for hot showers, flushing toilets and sinks from May to October. Check in is at 3pm and Check out is at 11am. Please visit the Office upon arrival to check in. Each site is $35/per night per RV or tent. You may have up to 1 additional tent with your RV for an added $15/per night. Pets are welcome for $5/per pet per night. Pre-reservation amount is due before arrival. First come first serve drive-in payment is due before setting up your camp. 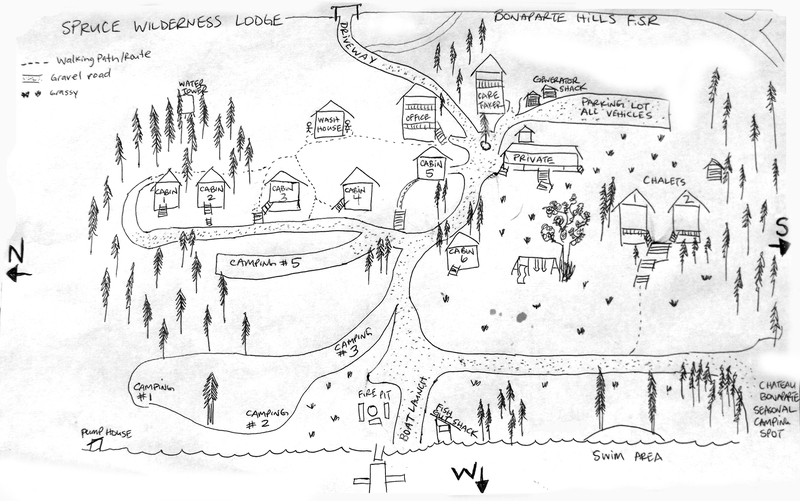 Click here to see a campgound map. We have seasonal spots available for your trailer or camper! Our summer lease is May to November. Please email or call us directly for availability and pricing. We are able to rent you the use of our entire resort for private events! Please email or call us directly to inquire about dates available. A 2 night minimum for Resort Rentals applies, starting from $1100.00 per night. Standard deposit of 50% applies upon booking to reserve. Pets charges and additional fees may apply. This is a great option for Family Reunions, Corporate Retreats, Weddings, Birthday, Anniversary or Bachelor/Bachelorette Parties. Click here to see pictures and details of the wash-house. If you are visiting for the day to have a picnic and/or spend time with a party who has reserved an accommodation, we allow you to use all our amenities for $10 a day per vehicle. All vehicles must be parked in our designated parking lot for the duration of your stay. Please note day use is from 8AM to dusk as the gates will be closed throughout the night. We believe pets are an important part of each family and do allow them to accompany you to our resort. Please state how many pets will with your group upon booking. There is a $5 per pet per day fee. All owners are responsible for clean up and disposal of pet waste immediately. Dogs with aggressive behavior, constant barking or generally disruptive dogs are not tolerated. Pets are allowed in only the accommodations you have rented and no other. Owners are responsible for any damages caused by pets. Thank you for helping to keep our resort pet friendly.